Join Red (the PI formerly known as Little Red Riding Hood) on a chase to solve a most terrible crime. With magical potions, sharp wits and a sweet pout, there is no telling where the chase may lead! NOTE: 1.3B is up, adressing a bug that made it possible to get stuck in the endgame. Please get the new version for a much better game experience. "A cute romp through several fairytale stories." This is a polished game with very nice graphics and a fun premise. It features a decent amount of gameplay, and both story and puzzles make sense within the game. You play as (no-longer-all-that Little) Red Riding Hood, and Red makes for a sympathetic heroine. You also meet a lot of other colorful characters taken from various fairy tales and children's books, and the game offers a cartoony, post-modern revisionism of these familiar faces (think [i]Wicked[/i], [i]Fables[/i], [i]Hoodwinked[/i], or [i]Enchanted[/i]). It is easy to see the fondness for the original stories. However, the solutions to most puzzles seemed quite arbitrary to me, with little to indicate how to achieve particular tasks. This made the game an exercise in "guess-the-designer's-mind", which is difficult and not particularly enjoyable. About two thirds of the way through, the story takes a sudden left turn, and this twist may not appeal to everyone. The writing is mostly good, but there are a few examples of unidiomatic English. Wonderful game indeed. 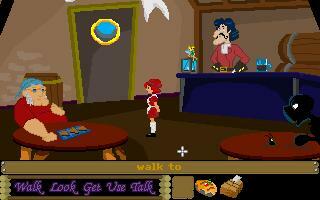 The graphics were nice and colourful, the puzzles were often clever, and the story was absolutely fantastic. An extremely enjoyeable game. It has a great concept, such an original story, adding a nice spin to some old fairytale stories and parts of this game had me in stitches. I just love how the characters from the fairytales have been given such a new, modern personality giving humour in some ways similar to the movie Shrek. The graphics are great, the music is catchy and the characters are all well designed and everything fits together nicely. The majority of the puzzles are all logical and were just challenging enough, though a few i really did struggle on but overall a very good game. this game was funny, I enjoyed it, and couldn't wait to see what crazy character I would see next, and they were all very interesting. some of the puzzles were a bit hard and I got stuck a few times. But overall the story was great and original, i would love to see a sequal, with red on more quests! I enjoyed meeting Hook, Smee and Tinker Bell ! An excellent game - well done! Top marks for everything except for the puzzles - there was one puzzle where there was no clue how to proceed, and the player had to guess and try all inventory items on everything... that's not fair. Otherwise great job - the graphics were pretty, the story was imaginative and novel and the game was a delight to play. Truly Excellent. I am amazed at what can be done in an amateur adventure game with AGS. Ghost writes well and pulls together many different fairy tale characters seamlessly. I thought the graphics were beautiful. Thanks Ghost for this adventure I had a wonderful time in Parodise! I loved, loved, loved this game!! Really well done! I enjoyed it a lot and recommended it as well to Nordinho. Thank you for a lot of fun! This game is very witty, with challenging but rewarding puzzles and a lot of parody on the best well known fairy tales' characters.